From Minnie: We love the taste of coconut – but have felt that we had to forego the pleasure of it for the past 6 months, since we have been eating healthier and trying to lose some weight. 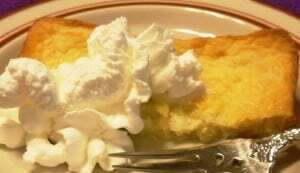 Today, I decided to attempt to remake one of our favorite coconut pie recipes in order to lower the calories and fat, without giving up the taste. We have always enjoyed this scrumptious coconut pie because it tastes so great and is so impossibly easy to make, since there’s no crust to roll. I switched out the sugar for the granulated no calorie sweetener, changed the regular Bisquick for the Heart Smart kind, reduced the fat of the butter for some lighter margarine, substituted unsweetened almond milk for the whole milk, and used EggBeaters instead of the 4 eggs called for in the original recipe. It was delicious both with and without the fat free Reddi-Wip I put on top when I served it. Yummy!!! Egg Beaters, Almond Milk, and Heart Smart Bisquick make this pie lower in claories without sacrificing taste! Heat oven to 350°F. Grease 8-inch square baking dish with cooking spray. In medium bowl, stir all ingredients until blended. Pour into prepared baking dish. Bake 50 to 55 minutes or until golden brown and knife inserted in the center comes out clean. Top with fat free Reddi-Wip and additional toasted coconut, if desired. Cover and refrigerate any remaining pie. I am definitely intrigued by the almond milk in this pie! I have never used it in baking but it does sound like a delicious alternative. 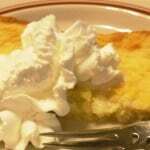 Also, I do love coconut pie and the fact that you were able to make it low fat without sacrificing flavor is awesome. I am saving this recipe-well done!